I just received a call on behalf of the MN Building Trades (612-379-4234) where they were push polling in support of providing corporate welfare to Zygi Wilf. The next question mislead about the state of the Vikings stadium plan. It prefaced the question by stating that Gov. Dayton is working on a stadium plan that’s good for the state because the Vikings would pay the majority of the construction and operating costs, and it would involve no new taxes. The question then asked whether I support the Governor in this plan. Why don’t I support him? Because the plan does not do what the MN Building Trades poll claims. They lied in their push poll in order to attempt to get me to support redistributing the public’s money to Zygi Wilf. This poll should be an embarrassment to the MN Building Trades. It’s absolutely black and white that the MN Building Trades is lying to people. When electronic pulltabs are used as a source of funding, the revenue generated from pulltabs is a tax. It’s state revenue. That pool of money could be used to improve the state by paying back the money that’s been borrowed from schools (thus generating union jobs within schools), paying members of the MN Building Trades to fix closed bridges in Minneapolis like the Sabo Bridge or Plymouth Bridge, or given to New Jersey businessman, Zygi Wilf. That’s a tax that we don’t need, applied to something we don’t need, thus detracting from things we really do need. Also, the public would be paying far more than half the cost of the stadium. Another lie from the MN Building Trades. I explained how the other day. When the Vikings are exempts from property taxes on valuable downtown land, exempt from the cost of materials to build their billion dollar stadium, exempt from hiring at least one employee at a living wage for every $25,000 in subsidies they take, exempt from paying property taxes on any additional businesses they run on the property for 200 or fewer days per year, and exempt from paying property taxes on capital improvement projects greater than $40m, it’s darn clear that the fine print falls in Zygi Wilf’s favor at every turn. This tips the scales far in Zygi Wilf’s favor (as if a 50:50 split on paying for Zygi Wilf’s business was somehow an equitable measure). In addition to that, the state’s plan involves an expensive form of bonding that’s essentially the state’s version of taking out a half billion dollar payday loan to give Zygi his gift. The costs FAR outweigh the benefits, which is why the Vikings can’t find enough legislators even willing to hold their noses to vote for this giveaway. The third question asked whether my elected officials should support Gov. Dayton’s plan. NO, THEY SHOULD NOT! And, thankfully, they don’t. My Minneapolis city council member, MN House Rep., and MN Senator are all opposed to Gov. Dayton’s plan. They are all DFL members, and all of them are definitely pro-labor. But, it’s not pro-labor to support corporate welfare boondoggle projects for the benefit of an out of state businessman when the state has unfulfilled construction needs. I’m sure that many members of the MN Building Trades have kids going to schools suffering from deferred maintenance. They likely drive their children to schools over bridges that have deferred maintenance. These are people who know that the state has real infrastructure problems that need to be solved. Real problems that deserve a far higher priority from the state than building an NFL stadium to replace our existing, functional, paid for stadium. The above retweet by the MN Building Trades is another example of a lie the group has willingly passed along in support of corporate welfare for Zygi Wilf. 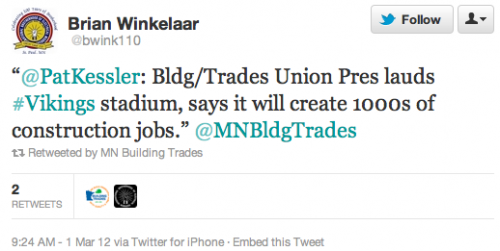 As I’ve explained before, claiming that stadium construction would create thousands of jobs is absolutely not true unless the MN Building Trades’ workers choose to work for less than minimum wage with no benefits. Next Next post: Does @savethevikesorg Support Dayton’s Plan to Raid the General Fund for Vikings Stadium #wilfare?